I have never been to Africa or Australia. I have seen both through magazines, documentaries and movies. I’ve tried to capture the colors from the different landscapes. After I made the necklace, I saw Africa. From soil to sunset. A hint of color from animals running into the brush. 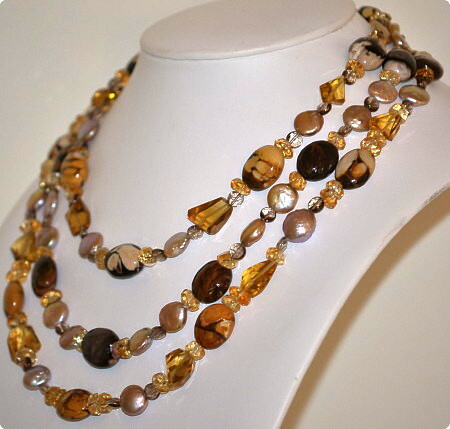 The main beads come from Australia. They are called Peanut Wood. Australian Peanut Wood is petrified wood (originally washed into the ocean as driftwood) with borings made from marine shellfish called Teredo (little clams) also known as shipworms. The shipworms drilled small tunnels into the wood and eventually the entire piece can be filled with bore holes. The worm holes give the appearance of peanuts and were filled with light color sediments while the wooden areas retained a dark color. Interestly enough, shipworms are not worms at all, but rather a group of unusual saltwater clams with long, soft, naked bodies. They are notorious for boring into (and commonly eventually destroying) wood that is immersed in sea water, including wooden piers, docks and ships; they drill passages by means of a pair of very small shells born at one end, with which they rasp their way through. This petrified wood was called Peanut Wood by the first people who found it because they obviously thought that the light colored areas resembled peanuts. They are found in Western Australia and are around 70 to 120 million years old. Not easy putting two continents together. I think you will see by my photographs just what I mean. The peanut wood is the main attraction. 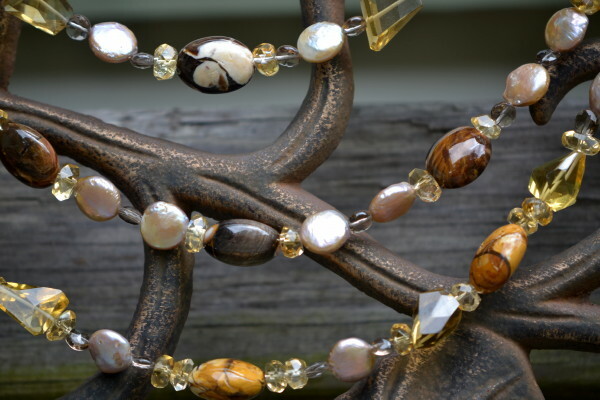 Champagne quartz, citrine, beige color penny pearls, and smokey quartz. I like the different textures. Very pretty and so interesting! So glad you like this blog!